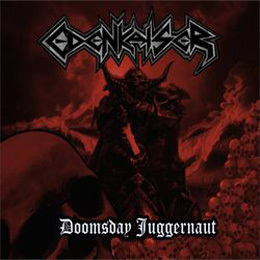 Doomsday Juggernaut was the first official release by Catalonian act Edenkaiser, originally self-released on February 7th 2014. I wrote a review back then, which was uploaded on May 8th 2014. But apparently this material has been re-issued on both CD and tape. Since Cold Raw Records did offer us their edition, I will re-consider my initial thoughts, which weren’t that positive (yet with a modest optimism). The last time I gave this act the benefit of doubt, and I am even more convinced. Their next effort will be a smasher; just think about a decent production and more conviction in execution, guys and girl! And forgive me my former review, for I was too severe, apparently.